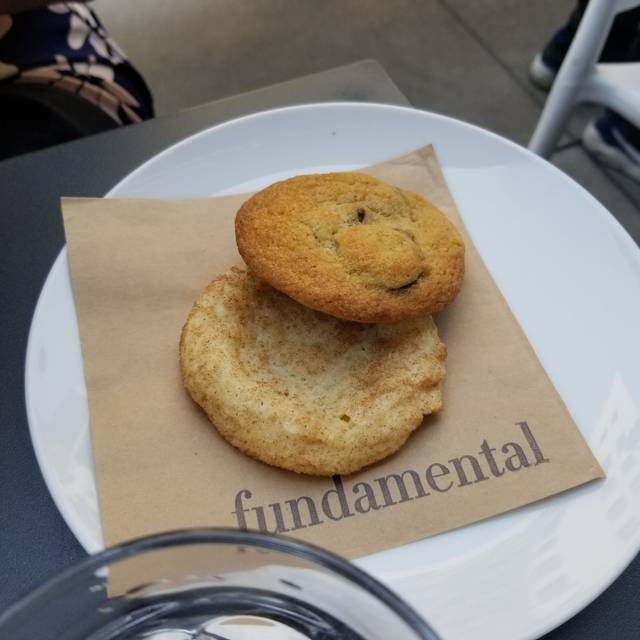 You must make reservations at least 5 minutes in advance of the time at fundamental DTLA. $4 parking after 6pm Monday - Friday at 801 S. Grand Ave.
Bring fundamental DTLA's delicious, market-inspired, lovingly made sandwiches to your office or event. We have a variety of sandwich, salad, side, and beverage packages to fulfill any needs you have, whether for a small gathering of 8, or a large event for 400 or more. Let us know what you're looking for, and we'll deliver straight to your meeting or event! Whether celebrating with family and friends, or hosting a larger holiday party, we are capable of crafting custom menus across a wide range of budgets to create occasions that you’ll remember. Our experienced events team will coordinate everything so you can relax and enjoy your event. Fundamental DTLA is a seasonal American restaurant with craft cocktails and natural wine in the heart of Downtown Los Angeles. $7/8 Cocktails, $7 Wine, $5 Beer, and snacks to boot! If only they had outlets I would stay all day, every day! Came in for brunch on Easter Sunday - The service was great, food was good, nice location. Loved this place. Both food and service were impeccable. My reservation was for 5 people but needed to add 2 more to the table. They accommodated us without any questions. Table service was on point with the server constantly checking on us, and making sure all of our drinks are never out. Food was simply delicious. Everyone raved about their dish. Thank you for the amazing brunch. Glad I got to share it with my family! I love this restaurant. I have had lunch here twice and dinner once. I love the decor. The servers are always friendly and the food is amazing. The only thing that was a little disappointing was the serving size of the delicious cornbread. I wish it was a little bigger for sharing. I cannot wait to try brunch and the oysters with wine. We went for the weekend brunch and it was all great. Service and food were on point. Price was good for the quality and value of the food. Great service. They were able to seat us immediately with the reservation. The table/space was cramped for a party of 6. Would like to have some hooks under the table for our bags since space was tight. Great meal! The aji sauce was delicious, even on the side of the breakfast burrito; the eggs plate was humongous; the French toast was the perfect portion; and the fried chicken sandwich was on point. Solid service, too. We especially enjoyed the 90s R&B playlist, lol. Don’t skip on the bloody marys - they were fantastically spicy! Great restaurant and would likely return. Unfortunately we hoped for one more bottomless mimosas, but they would not allow it because brunch was over. It would have been best if we were aware of an end time. Otherwise, everyone was wonderful. Said they were closed when we arrived even though we had made a reservation on open table. Went for breakfast. Our server was fantastic, very attentive and went above and beyond. Food was ok, we had breakfast burrito and granola. Milk in our coffees was burnt. I really had high expectations for Fundamentals because it was suggested by hotel concierge at the Intercontinental. However, both the food and service was poor during brunch. I ordered bottomless mimosas & due to the slow service was only able to enjoy 1 refill before my party was done eating. We received only a single check-in from our server Jasmine during brunch, who seemed nonchalant to do anything other than take our payment. Excellent service, tasty food, and a beautiful atmosphere. The sweet potato hash was insanely good as was the breakfast burrito! We sat at the bar and both the bartender and barista were so lovely. We will definitely be coming back! Relaxed DTLA restaurant. Food is excellent. Loved the egg sandwich. Would highly recommend for a casual bite! 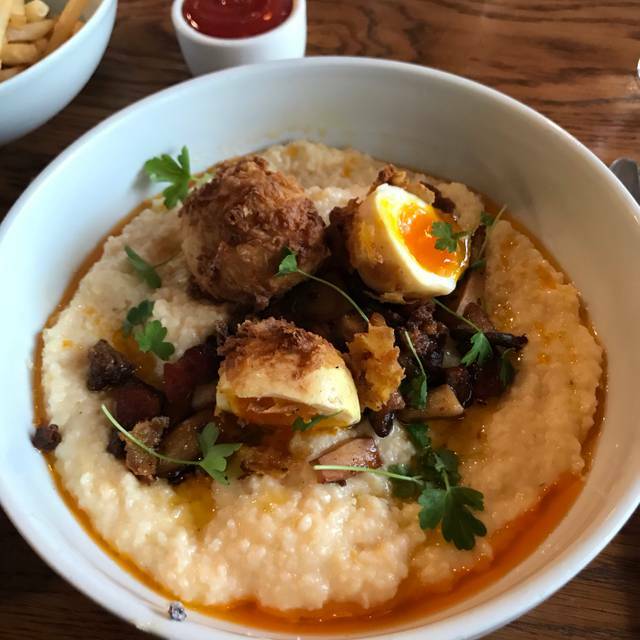 Loved loved loved my white cheddar grits! We had to wait 20+ minutes even though we had a reservation. The food was delicious. have been here a few times before, and service and food was excellent. yesterday, not so much. we had a server who was slightly inattentive and timid (perhaps new? ), and our order took about double the time it usually takes for us to receive it and it seemed as if it had been sitting for some time. our tot order was half the size as usual, so perhaps there was also another cook that day. unsure if our server even thanked us upon tipping her, as her voice was so low. will be returning, but perhaps with a different server. overall it was a slight bummer. Really enjoyed this place and will definitely go again. We went there for breakfast on a Sunday and it was delicious. Staff were accommodating when we asked to sit near the windows. Valentines dinner was delicious, and I would definitely come again. They accommodated for my friend for her seafood allergy. It was one of the best dinners I had in a long time. We felt welcomed, and attended to. Went for brunch. They water down the bottomless mimosas with soda water. It's a nice enough place, nothing special that was on menu. We tried 3 different entrees, Bahn Mi, Protein plate and fried chicken sandwich. All were ok.......the ingredients did seem fresh and reasonable portions. Awesome wine list, interesting cocktails, and delicious food. Great atmosphere and service. I will be a regular!! 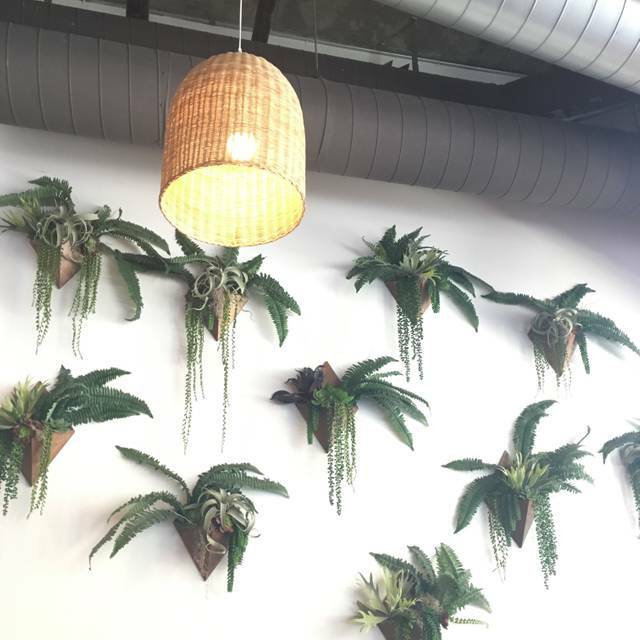 Great food, amazing service, and the beautiful decor! Nice spot - looks good, tastes good, they treat you well and it isn’t too expensive. Recommended! This used to be my go to for salad. There's this kale caesar that I'm in love with. I ALWAYS get it. Not sure what happened this time, but their quality control went down. Either that or they couldn't handle the DineLA pressure. First of all, we sat down before a couple tables, but received our food after them. Then, the salad was tasteless - not what I'm used to here. Third, I ordered a glass of wine that was $17, but it was half a glass. What a waste of money! I could have bought that entire bottle for almost the same price. At least give me a full glass? Then, we had to ASK for the remainder of our DineLA meal. Overall a disappointing experience. This was my go to place, but I'm probably not going to go back for a while. There were positives though. My fiancé's breakfast burrito was delicious. They also accommodated my dog with a water bowl when I asked. Overall a really cute restaurant, but I think they failed this time due to their first time participating in DineLA. I would recommend dining on a regular day. Knowledgeable server, very attentive. Pork chop had us perb flavor and fabulous craft cocktails. Must visit. Overpriced and not super tasty. Came here for brunch and we are happy with the service, food and location. Parking is across and it’s easy to get to the restaurant using a crosswalk. The restaurant is neat, bright and modern. 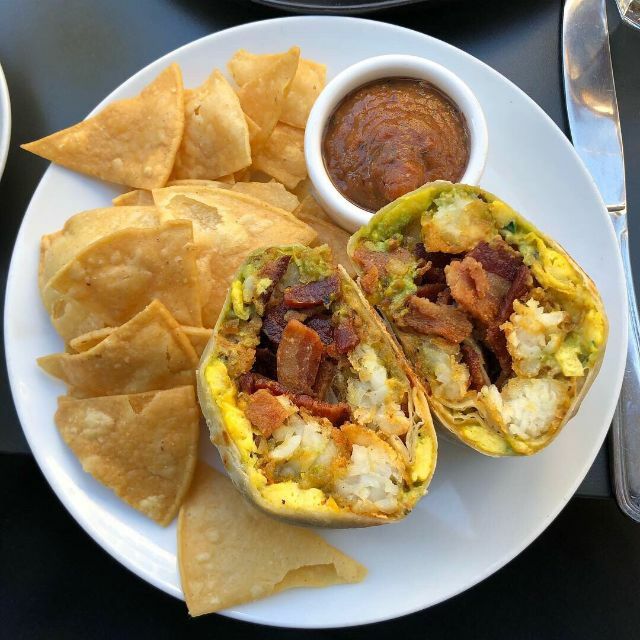 We had the breakfast burrito which was delicious. Service was excellent.! The whole meal was wonderful. Highly recommend the wine flight, as the somm is incredibly knowledgeable and the wines are quite unique. Will definitely be returning! Great food, lots of options, very pleasant sommelier with memorable recommendations/selections. Came here with a friend on a Friday night. I think it’s more of a brunch/lunch spot...it wasn’t busy. It happened to be DineLA with a special price fix menu ($39) for 4-course dinner. The server wouldn’t let my friend and I split one dineLA menu, but we really wanted one of the vegan main course options that wasn’t available on the regular menu, so we each ordered from there and shared. The food was pretty good, and everything was cooked well. Some of the flavors were a little off for us, however. Portions were generous - would have been shareable even though the server claimed 1 dineLA dinner wouldn’t be enough for 2 people. Overall, I feel it was overpriced for what we got. The best part of the meal was the wine flight - 3 wines chosen by the somm. He was INCREDIBLE - explained each wine in great detail, how and where it was made and all 3 were so different and beautiful. Will go back for wine/happy hour, but probably skip the food. Food was not great - tuna salad sandwich was dripping in mayo. 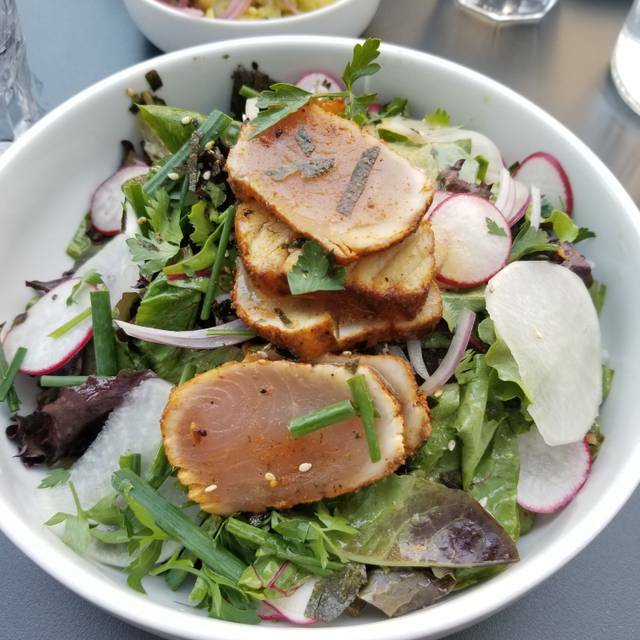 Service was friendly but forgetful (we asked for but never received share plates for a communal salad). Not sure if I want to go back. Modern and comfortable. Great service with yummy food. We will definitely be back. A refreshingly low-key spot with refined cocktails and delicious food. Special shout out to the adult happy meal; burger, fries, and a beer for just $15. We went for a pre theater dinner and they did a great job with the timing. The food was great, however, the menu was very misleading which lead to our bill being a lot higher than we expected. My feedback would be to clarify the IPA/Lager served with the Happiest Meal and when someone orders it, clarify the beer selection. Overall, the food was good, but miscommunication and confusion left me unsatisfied. Excellent market trio - highlights were the tots, cargo rice, and beets. Recommended to all my coworkers for an awesome lunch. Will definitely be coming back! 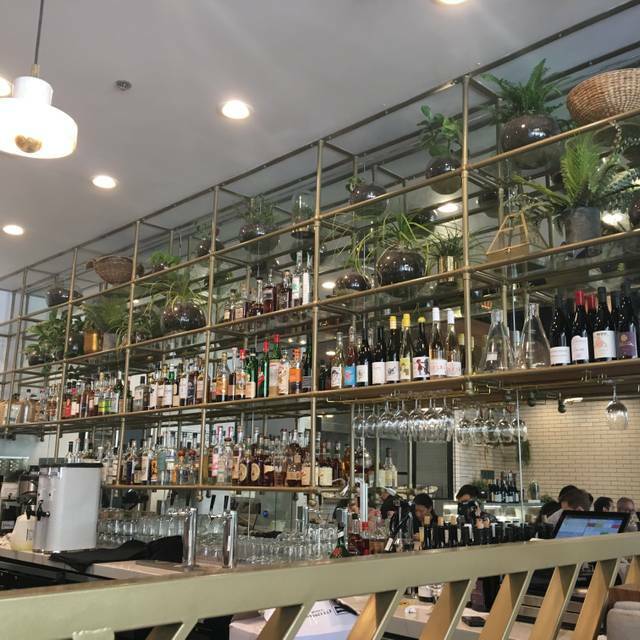 Chose fundamental DTLA for a work dinner (just coworkers) and was a little apprehensive about the small-ish menu as I wasn’t familiar with the groups culinary tastes. I didn’t have to worry.... everyone found something to be excited about and we all completely enjoyed every bite! We wanted a bottle each of red & white wine and had fantastic overview of the wine list and descriptions of the options we were leaning towards. Highly recommend this restaurant if you’re in downtown Los Angeles. Great brunch. We decided to come here before taking our daughter to the airport following Thxgvg . The menu was just long enough to provide creative twists on old favorites. for example I had the Eggs Benedict on Cornbread -- impeccably prepared and just different enough to add new flavors to a traditional entrée. at our table we had an Avocado toast with poached egg, an amazing egg sandwich and 2 orders of French toast (looked great when our neighbor ordered it!!). The drinks menu and wine list are every bit as creative. I started with a glass of Austrian "Orange: wine a Meinklang Graupert and then had a glass of Gamay from Domaine Thillardon. Both delightful (especially the Meinklang Graupert!!). Foodies will love the creativity. The restaurant is small, but bright and modern in its openness. We chose to sit inside as the morning was a little chilly. 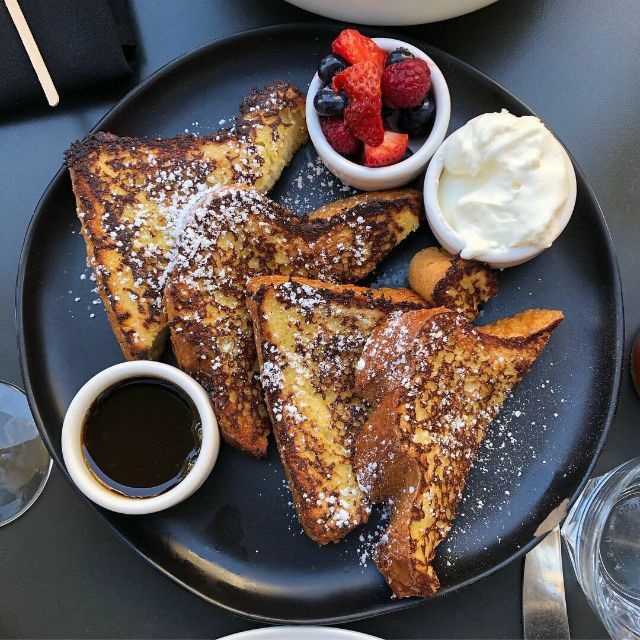 I can't wait to come back and try the restaurant's other offerings as well as visit their restaurant on Westwood in west Los Angeles. 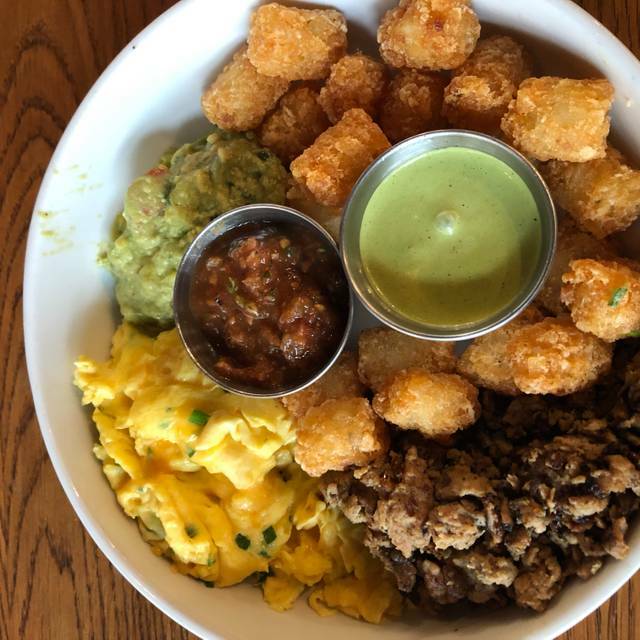 The breakfast burrito, with its crunchy tater tots, is OUTRAGEOUS! I want another one now, please!!! Their sides, like the roasted cauliflower, are delicious, and the service is always good.